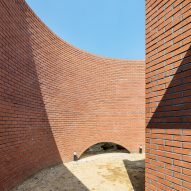 Seoul studio OBBA has completed a house in South Korea's Hadong county, featuring brick walls that wrap around small gardens to create private outdoor spaces connected to the living areas. Three brothers, who were born and raised on the rural site but now live in the city, asked OBBA to design a compact new house for their elderly mother in place of their old home. 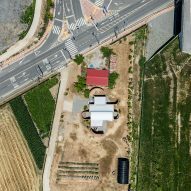 The Vault House is located on the edge of an urban area and is surrounded by farmland. A railway line passes along its southeast perimeter and a main road extends along one of the other sides. The house's proximity to infrastructure and the adjacent fields meant the architects needed to create a distinct boundary between public and private space, while attempting to retain views towards the nearby forests. 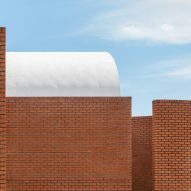 Rather than introducing a high screening wall around the perimeter of the site, the studio integrated the function of this "fence wall" into the 82-square-metre home's red-brick facades. The masonry surfaces create a solid barrier that wraps around the building to provide the necessary privacy, as well as protection from the noise of the road and railway. In places, the walls extend outwards and curve around to enclose secluded gardens. These intermediary spaces between indoors and outdoors increase the building's plan and accentuate its connection with the surrounding land. "By designing the fence wall, which is more commonly treated as an entity independent from the building, the house could be more functional and acquire a more flexible form," said OBBA. 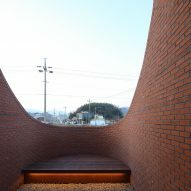 "Furthermore, the transitory spaces created by extended curvy walls allow richer spatial experience and add character to the moment where they meet with public space." 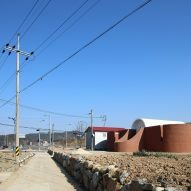 The curving walls lend the house an ambiguity that makes it difficult to discern which is the main facade or where the entrance is located. 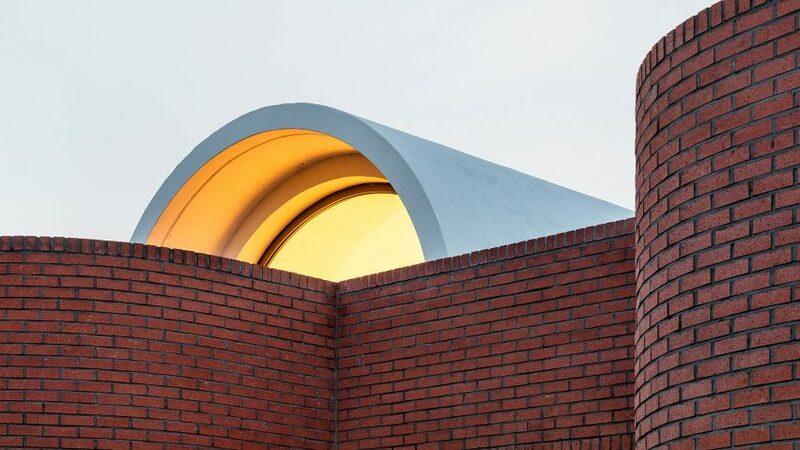 In fact, the front door is accessed through a full-height opening in one of the brick surfaces. Paving slabs set into the gravel-covered yard lead up to the simple black door. The house is arranged around a central living area, flanked at either end by sliding glass doors that open onto compact gardens enveloped by curving walls. A vaulted ceiling enhances the sense of light and space within the living room, which is connected by a corridor to a master bedroom and two guest rooms facing east. 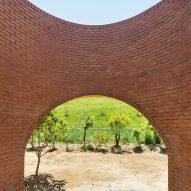 The wall that wraps around the north-facing garden swoops down to allow a view of the mountains of Bipa-ri island in the distance. 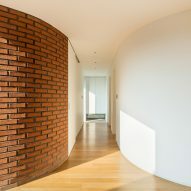 The brick cladding continues around a corner of the living space to accentuate the connection between indoors and outdoors. On the opposite side of the living area, a similar brick surface helps to reduce wind and noise from the railway. This curving plane incorporates a large arched opening that leads out onto a private rear yard. A further semi-circular wall encloses a small garden adjacent to the guest room at the eastern end of the building. 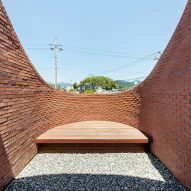 An opening at this base of this wall allows local cats and dogs to wander through. One of the walls lining the master bedroom also extends out from the building to shield the room from unwanted overlooking, while a storage area adjoining the kitchen is sheltered behind another curving surface. 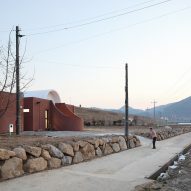 OBBA, or Office for Beyond Boundaries Architecture, was founded in 2012 by Sojung Lee and Sangjoon Kwak. 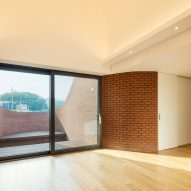 The studio's previous projects include a brick-clad property in Seoul with cutaways providing views over a walled garden, and another house in the South Korean capital featuring a retractable staircase and a loft for cats. Photography is by Kyungsub Shin and Jaekyung Kim.